It is easy to settle for average. It is easy to rationalize failures and disappointments. It is easy to blame others. It’s easy to stay within your comfort zone. It’s easy to give up. It is also easy to be lazy, procrastinate, be distracted and impatient. AND, be skeptical of those who cut corners, look for fast buck schemes, or take the easy way out. It is easier to win when you are prepared. Negotiating is simpler when you are open-minded. Telling the truth is better when you have seen the damage lying will do to a reputation. If you believe criticizing others is helpful, then why shouldn’t it be helpful when they criticize you? Those who “HANDLE THE HARD” deserve the rewards it brings. This is what separates the winners from the losers. So, take a different perspective when you encounter life’s difficult tasks and start appreciating what you are about to accomplish. Realize, that by taking on the HARD TASKS, you are about to become better, improve your position, or refine your skills … and there is nothing ever wrong with that. We always want everything to be easier in our life. Easy feels good. Easy feels relaxing. Easy is stress free. But, we need to do what is right and necessary, not what is easy. Anything worth doing isn’t going to be easy. 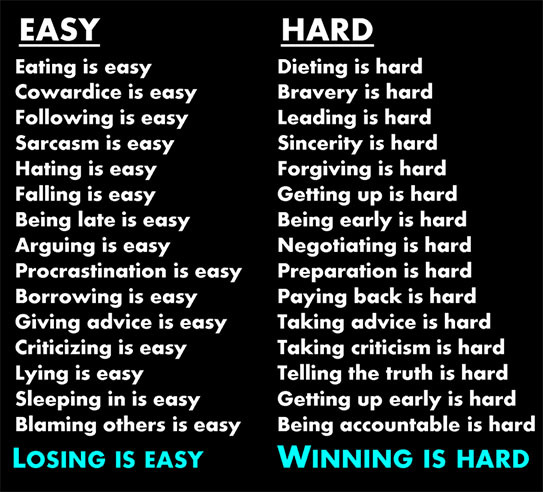 If we settle for easy … we will never savor success.